Achieving universal health coverage (UHC). Universal access to health care, particularly primary health care based on each country’s system, is fundamentally important. WHO will support countries’ progress toward UHC, leaving no one behind. This will include technical assistance and, working with partners, the design of a package of essential services based on interventions for reproductive, maternal, newborn, and child health, infectious diseases, and noncommunicable diseases. The result: Reducing persistent barriers to accessing health services and 1 billion more people benefitting from universal health coverage. Addressing health emergencies. Back in 2014, WHO was criticized for the international community’s slow response to the Ebola outbreak in West Africa. Now, building on the successful reforms of Dr. Margaret Chan, his predecessor, Dr. Tedros plans to measurably increase the resilience of health systems based on WHO’s International Health Regulations. Those regulations focus on building core capacities to enable a rapid response at the source of an outbreak in every country in the world. The result: Improved global health security, with 1 billion more people better protected from health emergencies. Promoting healthier populations. WHO will contribute to people enjoying better health and well-being through five platforms: human capital; noncommunicable diseases and mental health; communicable diseases; antimicrobial resistance; and the health effects of climate change in small island developing states. The result: Through an integrated and multi-sectoral approach, 1 billion more people enjoying better health and well-being. The WHO Secretariat makes it clear that the agency has a catalytic role to play, but no single actor can achieve these goals. Governments, civil society organizations, the private sector, other international organizations, and many others will need to act together. But WHO is signaling its ambition in a way that, in the years to come, could transform the organization and make a major difference in the lives of billions. At the same time, WHO plans to strengthen its normative work. One of the agency’s most important functions continues to be setting standards for public health. The road ahead contains numerous obstacles. Dr. Tedros told the Executive Board, “We cannot implement the [General Programme of Work] without transforming WHO, or without resources, or without strong leadership.” Within the WHO Secretariat, Dr. Tedros intends to bring about “a change of culture, a change of mindset” that focuses on measurable impact, management for results, and accountability for performance; that is not easy to pull off in any bureaucratic institution, particularly one serving 194 Member States. He plans to overhaul core business processes, from planning to procurement to recruitment. He recruited a highly-lauded leadership team, over half of them women. Now he must transform the culture organization-wide. Beyond WHO, the question is whether governments, particularly major contributors to WHO’s budget, will provide the necessary financial support to help Dr. Tedros achieve his ambitious but realistic goals. At the Executive Board meeting, governments agreed with his vision, but made it clear they were not (yet) making new financial commitments. Dr. Tedros is moving forward on his agenda urgently, yet governmental budgeting tends to be slow. Among major donors, this is not a propitious time to increase health assistance – even though WHO’s total budget comes to little over $2.2 billion dollars per year, much less than several other global health programs. In the near term, the WHO Secretariat may need to develop scenarios to meet top priorities even without full funding. Can Dr. Tedros pull this off? When he was Ethiopia’s health minister, I met with him in Addis Ababa and visited villages in southern Ethiopia to witness first-hand his innovative and successful Health Extension Program providing services at remote health posts. He was very impressive, and so was the program. Now, he approaches his role as Director-General with that same focus on promoting essential health services at the country level. And his stint as Ethiopia’s foreign minister has led him to understand the criticality of highest-level advocacy with governments, beyond the health ministries. One example: He told the Executive Board he will be sending a letter to every head of state to ask them to take three concrete steps toward achieving Universal Health Coverage. 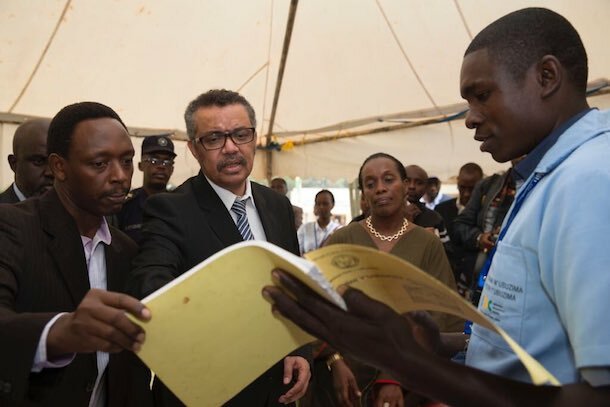 Despite a few stumbles, Director-General Tedros is off to a great start. Don’t bet against him. Ambassador John E. Lange (Ret.) serves as the United Nations Foundation’s Senior Fellow for Global Health Diplomacy.